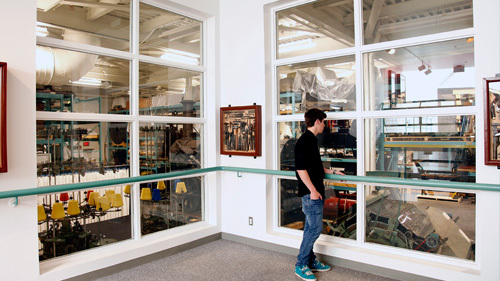 For a window on the collection check out the view into Storage Room One. The largest of our three onsite storage rooms, it contains some Really Big Things. With more than 30,000 artifacts in our collection, what you see on display is only a fraction. Why do we have more than we can display? Because we rely on artifacts to tell us a significant part of our history and must have examples from the variety of topics that make up the story of the industrial past and present in Nova Scotia. That way, we and future generations will better understand what life was like here. We use our artifacts for study, temporary exhibits, loans to other museums and communities, and when we occasionally refresh the displays that make up the central visitor experience.